(C No. 2) Preliminary Chart of Part of the Sea Coast of Virginia and Entrance to the Chesapeake Bay. 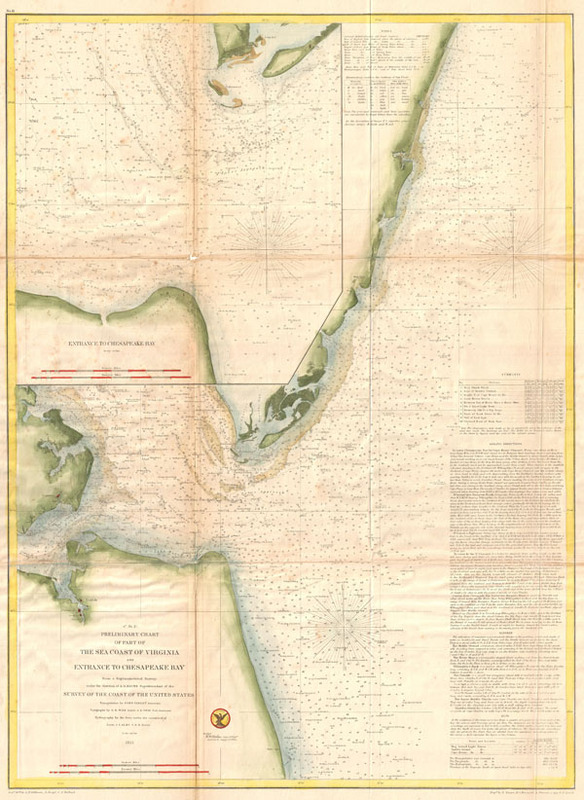 An uncommon nautical chart or map of the entrance to the Chesapeake Bay issued in 1855 by the U.S. Coast Survey. This map covers from Norfolk, Virginia to Gargathy Inlet. The chart features countless depths soundings as well as detailed sailing instructions and notes on currents in the lower right quadrant. The upper left quadrant is dominated by a large inset focusing on the entrance to the Chesapeake Bay between Smith Island and Cape Henry. The triangulation for this chart was completed by John Farley. The topography is the work of G. D. Wise and J. Seib. The Hydrography was completed by a party under the command of JJ Almay. The entire chart was produced under the supervision of A. D. Bache, of the most prolific and influential Superintendents of the U.S. Coast Survey. Published in the 1855 edition of the Superintendent's Report. Report of the Superintendant of the United States Coast Survey, (Washington) 1855. Good condition. Some discoloration and verso repair along original foldlines.